In 1983, Joe Catford arrived at The Open at Royal Birkdale with something genuinely revolutionary. Looking back now, it can be kindly described as a rough prototype – but behind its clunky appearance was the first commercial electric trolley. It was essentially little more than some steel tubing, a motor and some wheels, but it was the first design of what we all know as a PowaKaddy. Thirty-three years on, Joe's son David is now at the helm and the 500,000th trolley of their best-selling Freeway range has just rolled off the production line. Here is a look at the production line that’s built half a million trolleys in three decades in just 12 numbers! 330 individual parts are used in every single trolley construction, and that doesn't include the electronic components. 700 man hours of CAD work go into new trolley designs (before the first prototype is made). $25,000 to tool up a single wheel. That's why PowaKaddy wheels are universal for left and right – but they still need a front wheel at a similar cost. 4/6 Micro-chips in every trolley –more than NASA used to put man on the moon. They control everything from the speed, electronic braking and calculating the amount of calories you burn. 1 ex-Dyson vacuum cleaner engineer is responsible for producing the CAD work on most of the new designs. 150,000 bolts used a year. Along with screws, nuts and washers, it adds up to millions of pieces. 1,500 man hours are needed to design a totally new trolley from the ground up. 1 rolling road and a test track (to gauge stability, endurance, durability and to replicate uneven surfaces). 170 miles of electrical cable is used every year. It's not as much as some would expect but new 'plug and play' batteries and microchip electronics require much less cabling than their older counterparts. 55 minutes is taken to assemble, inspect and pack every single trolley. 70cm was the width of the original trolley. It was over-engineered so has now shrunk to 55cm, making it much easier to get the trolley in a car boot. 230 PowaKaddy service agents in the UK and 50 distributors worldwide. 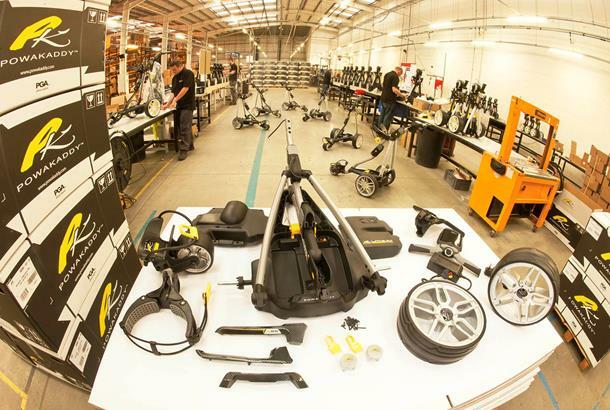 Did you know that PowaKaddy still design and assemble every trolley in the UK?